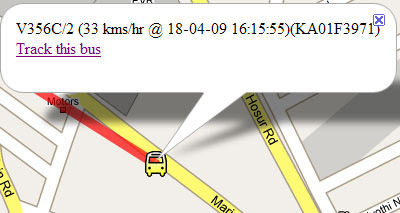 This site is tracking buses of the Bangalore Metropolitan Transport Corporation live on a Google Map. The buses all carry GPS units so the map is able to update locations once a minute. Google Maps (India) silently introduced the 'Get Directions' feature a week ago. There was no announcement or fanfare. Comparing with other similar and promising services from Yahoo and Live, Google has a long way to go in India.